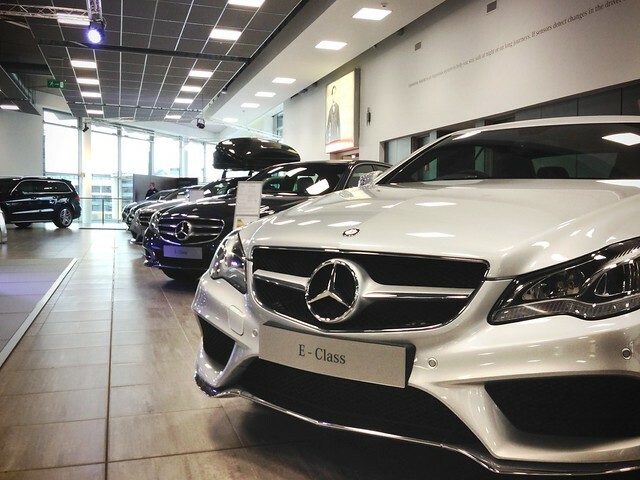 No, I don’t mean Brooklyn – we’re still in the UK and stopped off at Mercedes Benz world at Brooklands on the way to our airport hotel at Heathrow. This was my second visit to Merced Benz world at Brooklands, after a trip with Pistonheads earlier in the year. The difference was that this time the 600 Pistonheads cars had been replaced by cars being auctioned. There were all sorts of cars from Minis to Dodge Chargers, a bat mobile and, of course, loads of Mercedes Benz cars! My favourite was a 1960s Lotus Europa, which at a hammer price of £8000 was under its reserve. It was also good to see an Alvis in the metal – Jen’s granddad worked at the Alvis factory in Coventry for most of his life. Now we’re at an airport hotel, waiting for our flight in the morning; so going to try and get a good nights sleep. Bon nuit! This entry was posted in Travel and tagged iPhone, New York, Photo by Lewis. Bookmark the permalink.